Toran or Bandhanwaar is a door hanging usually decorated with marigolds and mango leaves, or a string that is tied on doors with motifs on it as a part of traditional culture on the occasion of festivals and weddings. They may feature colours such as green, yellow and red and can be made of fabric or metal. 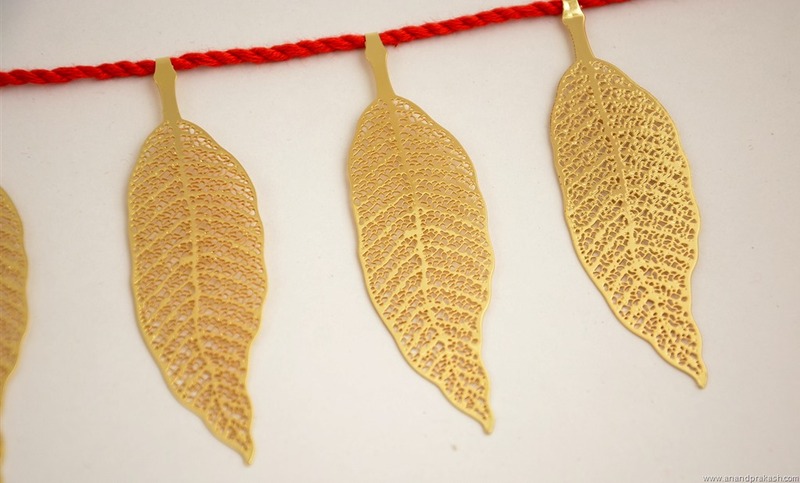 Our bandhanwaars are made with intricate metal in the shape of mango leaves, Ganesha, elephant and peacock motifs. Lacquered for protection. Comes in a recycled wood gift box. This entry was posted in Whats New and tagged Anand Prakash, Bandhanwar, Diwali Decoration, Door Hanging, Mango Leaf in Brass, Metal Wall Decoration, Toran, Wedding Decoration. Bookmark the permalink.